Men's Modern Two Tone Wedding Ring : LOVE2HAVE in the UK! 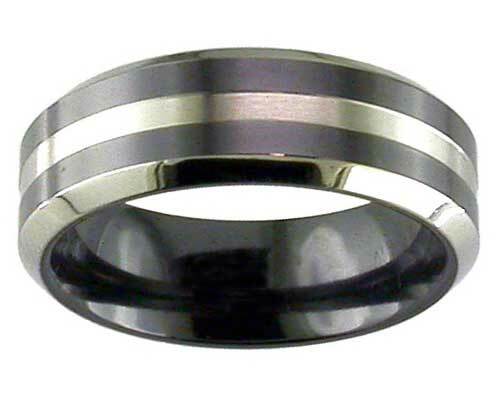 A men's wedding ring with a modern two-tone design. At Love2Have we excel in featuring the highest quality contemporary style men's wedding rings at prices you can afford with this unique ring being no exception to the rest. Here we have a two-tone zirconium ring suitable for men. It features chamfered edges on a flat profile. The two-tone colouring comes created from the natural colourless zirconium being heat treated to black and then machine skimmed. We call this technique relieving or 'relieved' black. The ring has two black stripes and a single colourless stripe in its centre that creates a very modern striking two-tone look indeed. The chamfered edging is also neutral, and the entire ring itself comes in a satin finish, but you can have polished if you prefer. It measures 7mm wide, but others widths are available too.